If you are looking for a place in Herefordshire where you can enjoy real ales and delicious home cooked food, look no further! A warm welcome awaits you here at the Prince of Wales, a traditional pub in Ledbury that was Herefordshire CAMRA Pub of the Year in 2013. Why not pay us a visit and enjoy some of our fine selection of real ales? If you are unsure where we are located, there is a handy map on the contact page of this website. The Prince of Wales is more than just a place to eat a drink – it is a vibrant place, right at the heart of the local community, and somewhere where you have the opportunity to relax with your friends whilst making new acquaintances. Don’t take our word for it though! Come along and pay us a visit! You’ll be glad you did! Here at the Prince of Wales, we have live music from bands every Sunday afternoon, and every Wednesday we have our traditional jamming session with the locals. Our live music sessions have a great atmosphere, and offer the opportunity for you to enjoy quality live music whilst you relax with friends over a pint of beer and delicious home cooked cuisine. It really has to be experienced to be appreciated! 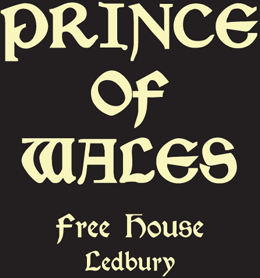 Whenever you are looking for real ales, home cooked food and live music in Herefordshire, there is only one name that you need to remember: the Prince of Wales. Don’t take our word for how great our venue is – try us out, and prepare to be amazed! We look forward to welcoming you soon.